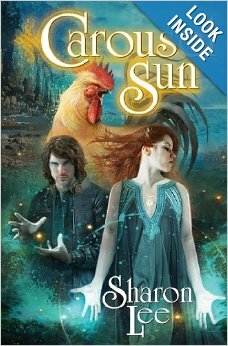 Like its prequel, Carousel Tides, this latest solo effort by award winning author Sharon Lee, co-creator with her husband Steve Miller of the acclaimed Liaden Universe series, Carousel Sun is a jewel. Once again, reluctant Guardian of the land, Kate Archer, rises to the defense of the land of Archer's Beach in the fabulous country of Maine against the forces from away. Kate is a damaged soul, after being captive and being assaulted by an evil Ozali (wizard, sort of) in the Land of Flowers, one of the six worlds that touch on ours. Having escaped, she ran all the way to the magic land of Silicon Valley and became a computer programmer-- about as far as you can get from tree spirits, water spirits, and her Guardianship. But when her grandmother disappeared, in Carousel Tides, she returned to Archer's Beach to take up her burden. Kate is funny, smart, and reluctantly powerful. She seems to stumble from one adventure to another, all centered around Archer's Wood and the century-old carousel she runs at the beach. But Sharon Lee's excellent plotting and great dialog draw the reader in, and make it possible to believe in a world where trenvay live in trees and work on the Midway and where a thousands of years old selkie named Borgan is the Guardian of the Sea around Maine's coast and Kate's opposite number as Guardian. Kate, recovering from her abuse as a child seems destined to fall in love with Borgan and unite the Land and Sea, but we will have to see how it plays out in the last volume of the trilogy, Carousel Seas forthcoming next year from Baen Books. Buy this book for a refreshing change from typical paranormal romance or urban fantasy. Great story, inventive world-building, and excellent writing make this a serious contender for awards. Buy the book at Baen Books or at Amazon or your other favorite bookseller.